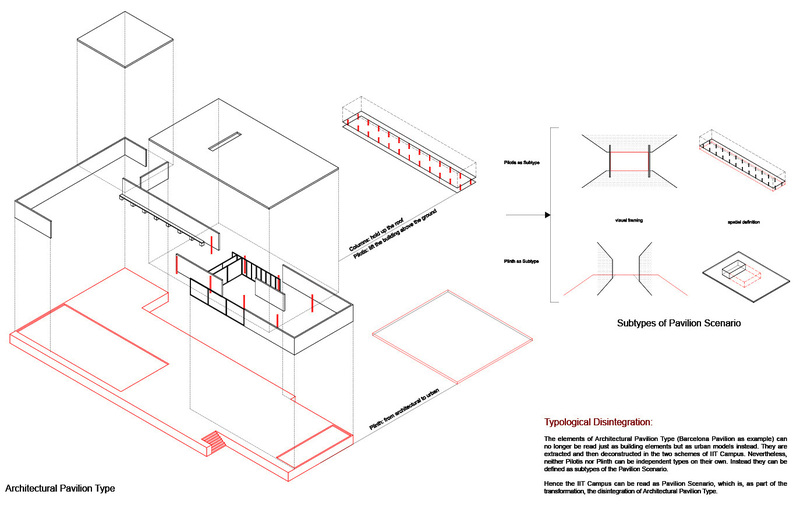 I read Mies van der Rohe’s architectural language as a series of typological transformations. In Mies’s oeuvre, buildings have shared elements that are constantly and gradually evolving throughout his career. In his American period, columns and the podium that are part of an architectural pavilion type and derived from the Barcelona Pavilion, can no longer be just understood as architectural elements and are equally used as an urban model. In the two schemes for the IIT Campus Master Plan (Chicago, 1939–58) they are first extracted and then deconstructed as pilotis and plinth. At this moment of reinterpretation, neither pilotis nor plinth can sufficiently express the richness required to form an independent type, yet their repositioning and lateral transformation make them qualify as ‘subtypes’ within the overall type of IIT Campus. 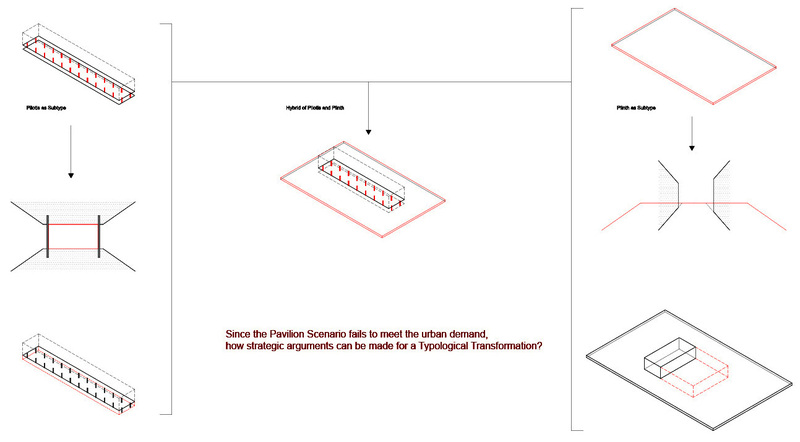 Consequently the systemic set they are part of, enables the IIT Campus to be articulated as a pavilion scenario, which results from the disintegration of the original architectural pavilion type. 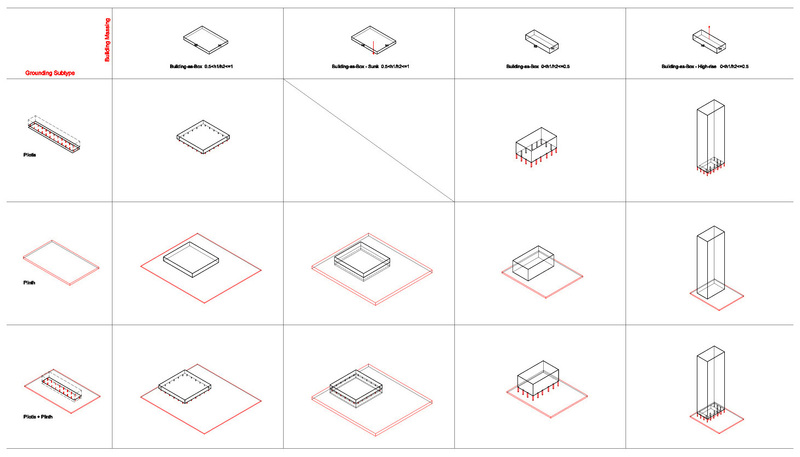 Furthermore, in Mies’s later high-rise projects, the insertion of these subtypes into a specific urban context permits a redefined interaction with a different system, which creates a newly reassembled type: the urban pavilion type. It is a transformation of the architectural pavilion type, yet the urban characteristic obtained in this reassembled type was never embodied in the original type. Thus, what generates this redefining characteristic? It is the subtype of the ‘ground scenario’. Then, what exactly is the subtype of a ground scenario in this instance and how specific is its interaction within the overall system? As stated in the book Mies in America, the ground plane and roof plane are of overriding significance in Mies’s oeuvre and form his architectural vocabulary. 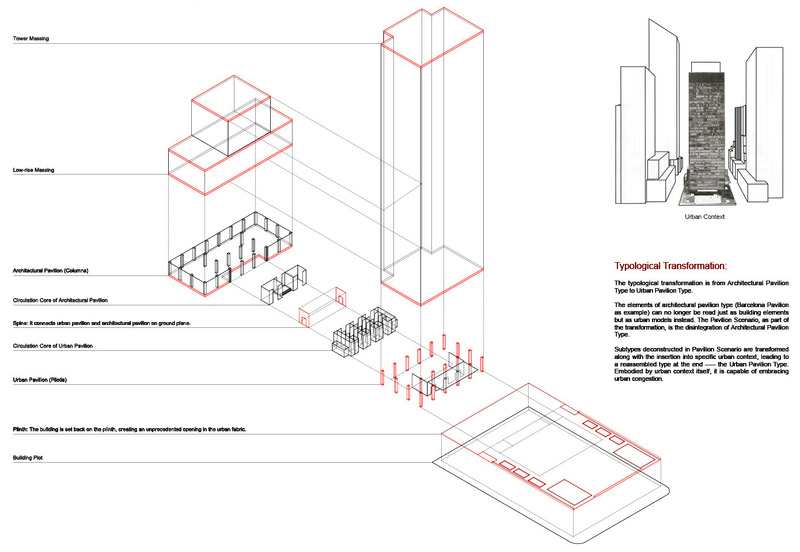 In the Miesian high-rise, ground plane and roof plane define the layers and interrelations between the uniform tower and traditional ground, while instrumentalizing an architectural vocabulary of plaza, plinths, pilotis, spine and landscape. All these elements identify and formulate the subtype of the ground scenario. It reframes a typical ground condition and creates subtle but significant spatial experiences for users. The subtype of the ground scenario contributes to an unexpected opening in the urban fabric through the innovative gesture of setting back the tower on the plaza. 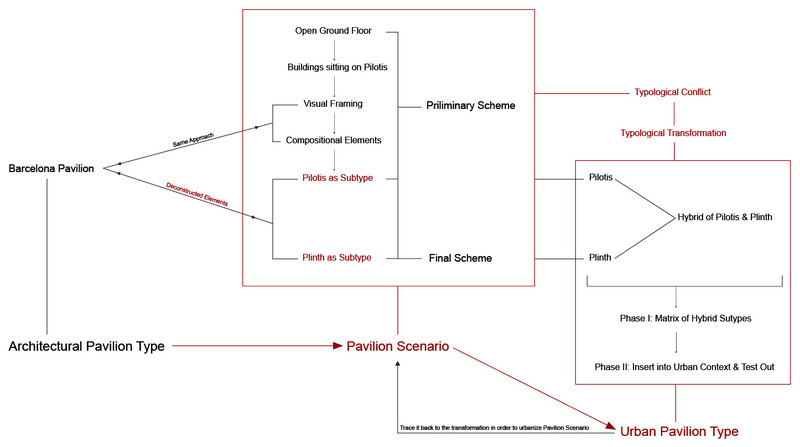 This ground scenario also conveys varied spatial layers at the ground level of: solid interface – transparency interface – pilotis – open plaza. The penetrability of the ground layer indicates the defining character of Mies’s approach to spatiality in the city. 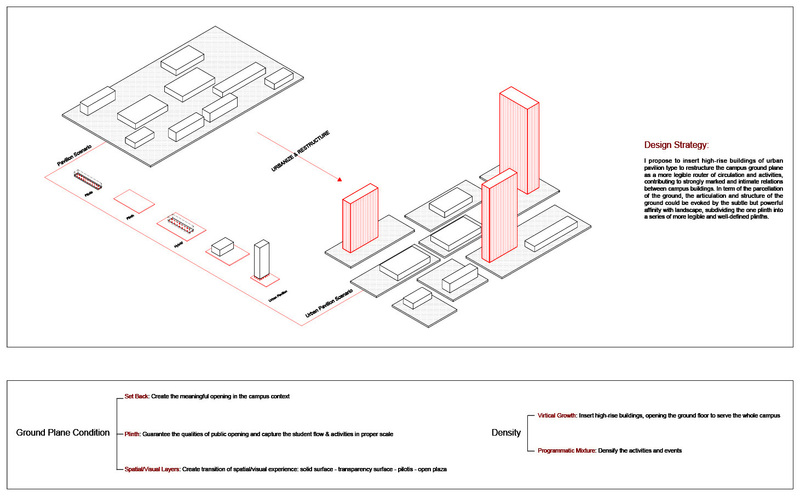 The subtype of the ground scenario is the most dominant characteristic within the urban pavilion type, which sets it apart from other high-rise building types. 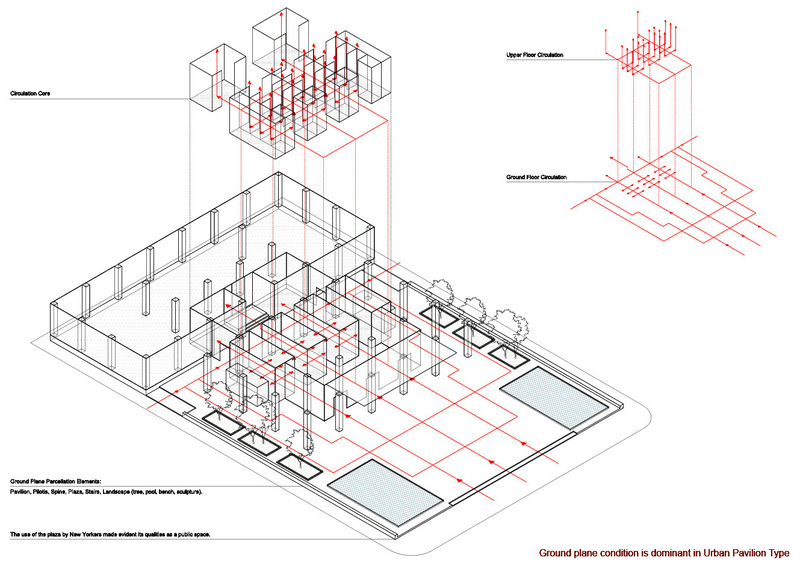 The pronounced ground scenario evokes the conceptualization of the privately owned public space, providing a place of repose and prospect in a dense urban context. Various cultural and commercial activities make evident its qualities as an urban public space. This ground scenario was acknowledged by the New York City government, and in 1961 even formalized by a land-use policy that rewarded the provision of amenity and open space at the ground level with additional development rights. This has significantly contributed to the development of New York City. 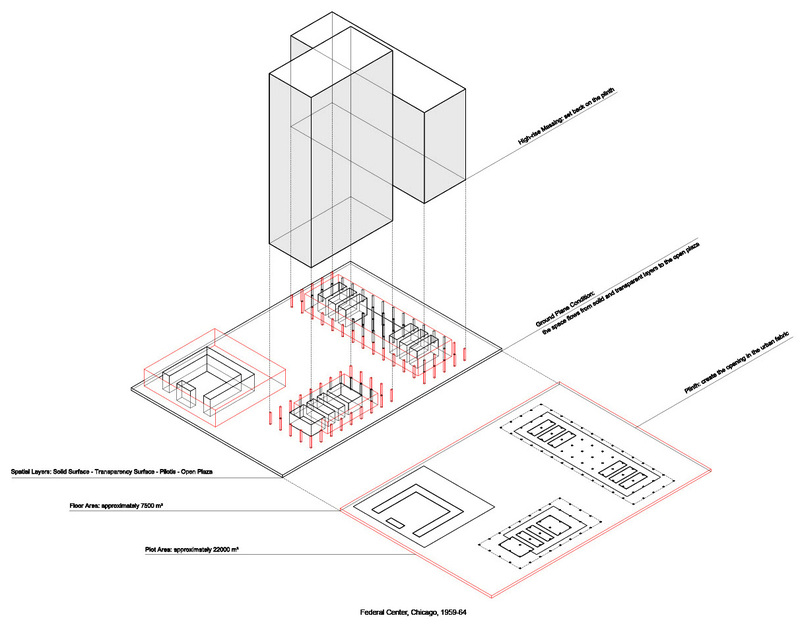 The transformations towards the urban pavilion scenario where further explored in a counter proposal for the IIT Campus, as a latent Miesian project. Bring in or Take out? Subtype is a concept defined by the author. An independent type is a systemic set of subtypes. The subtype entails its pliability as a constituent part of the overall type and its capacity as the subdividing instrumentality among programmatic, organizational, socio-cultural, political, economic and ecologic aspects. Lambert, Phyllis, and Werner Oechslin. “Learning a Language.” In Mies in America. Montréal: Canadian Centre for Architecture, 2001. Print.